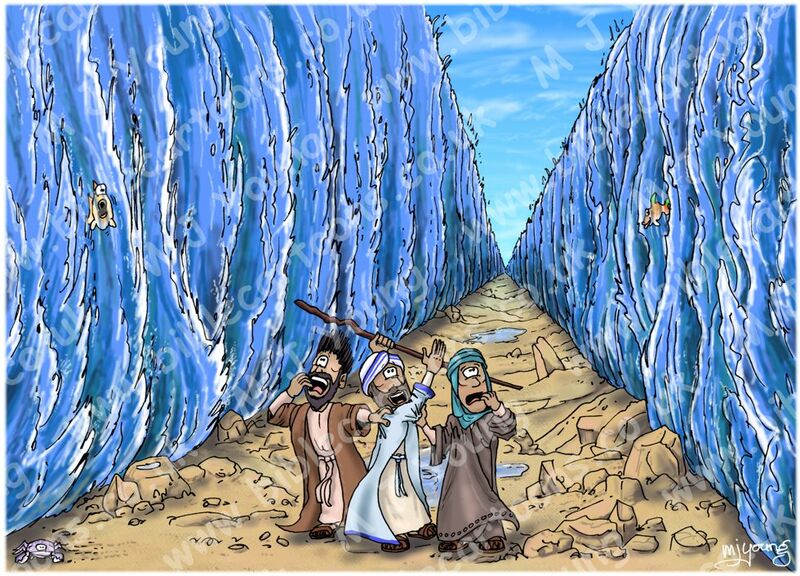 … and the Israelites went through the sea on dry ground, with a wall of water on their right and on their left. Verse 21 tells us that these events happened at night. The moon casts a cool, blue light into the scene, which is contrasted with the yellow/orange glow coming from the pillar of cloud/fire, which is behind the viewed. The moon light & fire light is reflected in the sea water which is parted by the power of God. It can also be seen on the faces & clothes of the figures. Moses (holding staff on top of rock), various Hebrew people, walking past him, towards the horizon. A crab can be seen on a rock, with coral, in the right foreground. This scene has Egypt behind the viewer, & Sinai & the promised land ahead. Exodus 12:34 tells us, “The Israelites took their bread dough before yeast was added. They wrapped their kneading boards in their cloaks and carried them on their shoulders.” You can see a woman carrying her kneading board/bread on her shoulder in the bottom left of this scene. I am very pleased with the light effect in this illustration. This is the first version of this scene which I drew in July 2009. 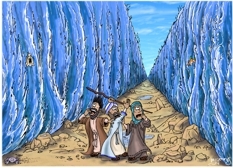 At the time I didn’t realise that this whole episode (the Hebrew people passing through the Red Sea) happened at night, which we know because verse 21 tells us so! Oops! My new cartoons (versions 02 & 03) are set at night.